HARLINGEN — Local resident Debra Cruz sat at a long table in front of a handful of lawmakers who were focused directly on her. 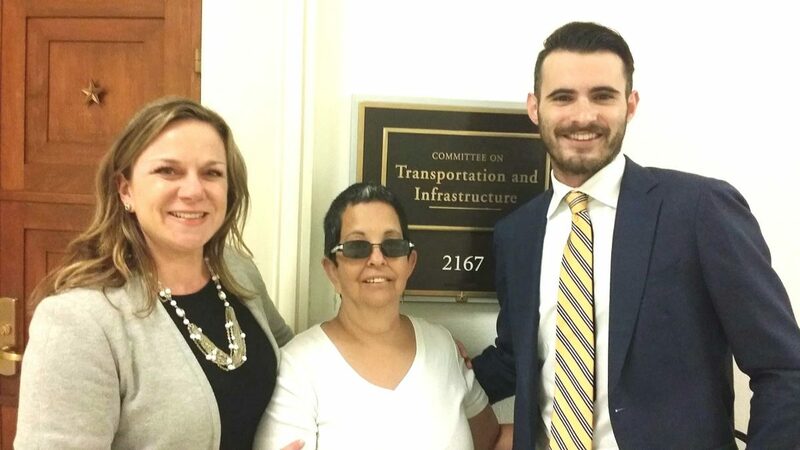 Cruz spent three days on Capitol Hill earlier this week speaking with lawmakers and in front of the Committee on Transportation and Infrastructure, telling her story about the trucker who changed her life and what should be done to make trucking safer for everyone on the road. It’s something she never even dreamed of, as she said, “Oh my God, this was exactly like you see it on TV,” referencing the hearing setup. She focused on the importance of regulation because the driver of the truck that struck her had a drug history. In 2008, while on her way home from work on a Friday night, an 18-wheeler crashed into her 2003 Dodge Neon near Sebastian. Her life has never been the same. She wears sunglasses in her living room to protect her deteriorating eyes and has short-term memory loss. She can’t go through metal detectors and keeps her hair cut short enough to sometimes show the scars on the back of her head. She’s permanently disabled, walking with a cane and in constant pain. But, Cruz hasn’t let that stop her from telling her story and bringing more awareness to the problems in the trucking industry. Two years ago, Cruz was part of a large contingency of families and individuals from across the country there to talk about trucking safety. At that time, she spoke with individual senators and congressmen. This time around, she was told there are some bills that have been introduced about more stringent background checks and regulations regarding sleep and not using pills to stay awake. Cruz said she believes she was again able to make a difference by telling her story and what she has endured. She said she received applause and statements from lawmakers about her strength and resolve. Cruz said there is a lot that can be done to make the roads safer and improve truck driving safety. “I feel like I am still here for that reason,” she said.